1. Proved reserves of both oil and natural gas in 2010 rose by the highest amounts ever recorded in the 35 years EIA has been estimating U.S. proved reserves. 2. Technological advances in drilling and higher prices contributed to gains in reserves. The expanding application of horizontal drilling and hydraulic fracturing in shale and other "tight" formations, the same technologies that spurred substantial gains in natural gas proved reserves in recent years, played a key role. Further, rising oil and natural gas prices between 2009 and 2010 likely provided incentives to explore and develop more resources. 3. Oil proved reserves rose 12.8% to 25.2 billion barrels in 2010, marking the second consecutive annual increase and the highest volume since 1991 (see chart above). 4. Natural gas proved reserves (estimated as "wet" natural gas, including natural gas plant liquids) increased by 11.9% in 2010 to a record-high 317.6 trillion cubic feet (Tcf), the twelfth consecutive annual increase, and the first year U.S. proved reserves for natural gas surpassed 300 Tcf (see chart above). 5. Proved reserves reflect volumes of oil and natural gas that geologic and engineering data demonstrate with reasonable certainty to be recoverable in future years from known reservoirs under existing economic and operating conditions. "Most impressively, proved gas reserves in 2010 were up 50% compared to the 2005 number or the 1980 number. That's right, our proved gas reserves are 50% higher in 2010 than 30 years ago, despite using a lot of gas during that 30 year period. Indeed, during the last 30 years, the country consumed more than double the amount of our 1980 proved gas reserve number. How could that be? Exploration and production activities are never ending. They keep filling the U.S. natural gas cup that has never emptied and is now overflowing. 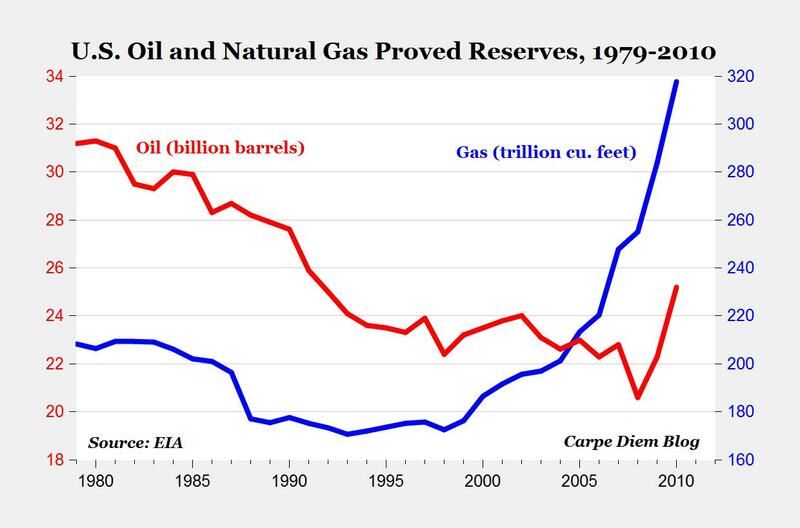 So our proved reserves of natural gas have gone up for 12 straight years, increased during 2010 by the highest amount in 35 years, and are 50% higher than in 2005 or 1980." MP: The EIA's significant upward revisions for proved reserves of U.S. oil and gas provide more evidence that America's job-creating, game-changing, economic-stimulating energy bonanza just keeps getting better and better all the time. "Nature — or perhaps Nature’s God — seems to love mocking pundits. Just when the entire punditocracy, it sometimes seemed, had bought into the “American decline” meme, Europe collapsed and huge energy reserves were discovered underneath the United States. The “special providence” that observers have from time to time discerned in America’s progress through history doesn’t seem to be quite finished with us yet." I guess that the EIA never got the memo that producers could not make a profit and are now writing off shale assets that used to be considered economically viable. Sorry but you can't create reserves by the stroke of a pen because you assume EURs that are twice what the actual production data suggests is accurate. What was once seen as untouchable can now be counted as proven reserves. New technology has dropped costs considerably. It almost does seem comical: just as pundits are once again whipping out the old, tired "We can't afford it! It will never work! We've found all we can!" axioms, something like super-fracking comes along and pushes the "peak [insert resource]" point further out into the future. Human history is one of constant progress. it seems like every generation has its Luddites claiming technology will kill us, its stagnation saying we've peaked, and its defeatists saying "this will never work." Nothing in the course of human history supports them, and I see nothing now to justify that behavior. True but it is also full of examples where naive fools were separated from their money by cons who used hope and greed against them. Maybe, we should try to keep things in perspective; for the last four weeks oil imports have averaged 8.9 Million bbl/day. And, even with Europe and Japan in recession, and the U.S. teetering thereabout, the world price of oil is $108.00/bbl. "it seems like every generation has its Luddites claiming technology will kill us..."
Yeah, here's one, and here's another. Improvements are constantly being made in the fracking process. It could be that today's price is regarded as "high" in another dozen years. Note that it is easy to make methanol from natural gas, and methanol is a perfectly fine fuel for cars and trucks. Perhaps. But I think that your ignorance of the history of fracking, horizontal drilling and their uses has blinded you to the fact that the big improvements are already behind us. The fact is that when you add up all of the energy that you use to create the pipes, cement, fracking liquids, and the other inputs, and you add to that the energy it takes to drill the wells, encase them in cement, do the fracking, treat the waste liquids, gather the oil and gas, and transport them to the hubs you find that it is in the same ballpark as the energy that is contained in the oil and gas that are produced. For shale oil and gas to be viable the energy content in the product must be much higher than the energy that it takes for production. But methanol would require a massive investment in new infrastructure because it will corrode the current pipelines and storage tanks. It would also destroy most engines so you are looking at a replacement of the vehicles that are currently on the road. But that replacement takes new energy that we cannot produce in the quantity that is needed. And as I pointed out above, there isn't enough nat gas to meet our transportation needs and to keep producing electricity. Shale is close to the bottom of the barrel and is only produced when you are desperate. And once you deplete the core areas it makes to sense to go anywhere near the marginal deposits. Where is the 100 year supply of natural gas? 315 TCF reserves/25 TCF annual production = 12.5 years. President Obama is right about the bright future of American energy." 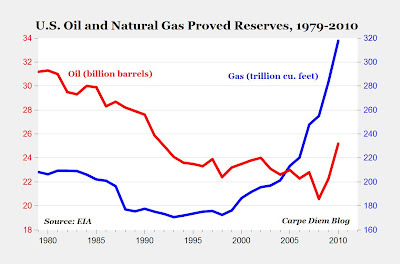 I am referring to proven natural gas reserve estimates. Even the head cheerleader for the gas industry, the American Gas Association, confirms 13 years of supply for 2011 reserve estimates. If proven estimates of Reserves/Production have not materially changed in the last decade, the natural gas energy bonanza is a misnomer. National Petroleum Council reports here that the U.S. has between 1,500 to 3,600 tcf. "This resource base could supply over 100 years of demand at today’s consumption rates." At the high estimate, there would be 156 years supply of natural gas. A study by MIT reports that the U.S. has 2,100 TCF of natual gas, about 91 years supply. Bailey has been wrong on the AGW fraud and is clueless when it comes to energy. He finally has figured out that much of what he was told by the IPCC and the warming crowd needs to be questioned and will figure out the shale scam once it becomes evident to most people. If you want to convince us I suggest that you show us that shale gas production is self financing and that BHP and Encana were wrong to write down some of their shale assets. There is no evidence that shale gas is economic so I don't see how you can trust the report. Do you really think that if shale gas production was economic you would see such a reduction in gas rigs? The link is broken. Fix it and some of us will show you where you went wrong again. Here's a link to the MIT study reporting that the U.S. has 2,100 TCF of natual gas, about 91 years supply. And here we go. Let us begin with just one statement and we can go on from there if necessary. In the 'study' we read, "Of the mean projection, approximately 400 Tcf could be economically developed with a gas price at or below $6/MMBtu at the well-head." This seems simple enough. But where is the evidence to show that the statement is true? $10 million wells that take two years to lose most of their productions require many more drill rigs than are available if you are going to get to the level of production that is being projected. This means that an increase in drilling means an increase in drilling costs until the supply chain is capable of providing the necessary services. And let us note that many of the cost projections are based on the EURs that have been claimed by companies but are not supported by the production data. 2. GHG emissions pricing, through a cap-and-trade system or emissions tax, leads to a 50% reduction in U.S. emissions below the 2005 level, by 2050. This is one of those 'green' studies that is about advancing an agenda, not looking at real science. It is not a scientific paper because there is no real peer review and no credible data that is examined for accuracy. It is assumptions based on other assumptions that come from unaccountable bureaucrats. If any of you want to base your conclusions on policy papers go ahead. I think that I will stick to the facts and look for evidence in the 10-K statements. North Dakota: America's "Economic Miracle State"
Markets in Everything: 3D Printed "Magic Arms"